Aside from my main objective of visiting the sites of the D-day landings, there are other places to visit in Normandy, among them a route that follows the path of the famous impressionist painter and many WWI sites. In addition to all of this, one of my best friends works in Brussels, and I thought it would be a shame to be so close and not pay him a visit. 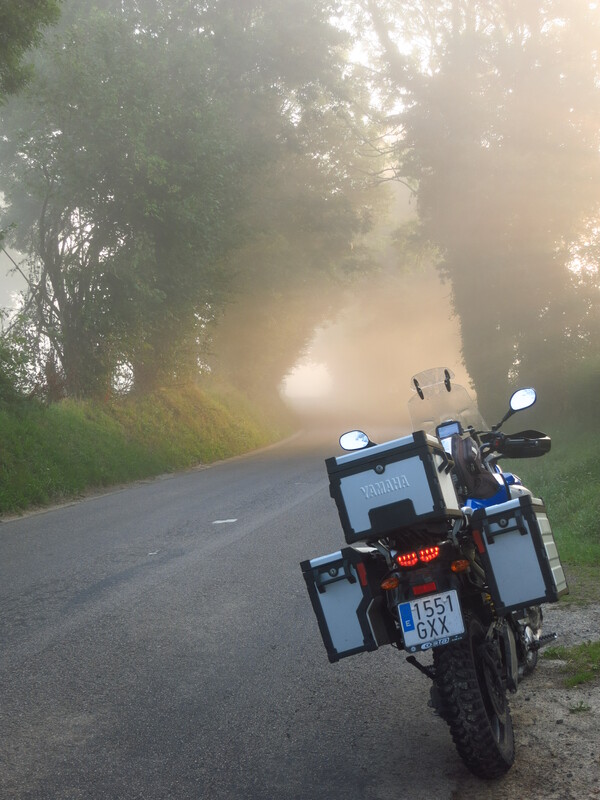 So, with only a few days left of holidays (two of which had to be used for the ride back to Barcelona), I set out to plan the perfect route to visit the best of Monet landscapes, WWI battle sites and reach Brussels in the evening. I got up at 6am, and set off before 7. It was still quite dark, and a thick fog covered Caen. The sun did not break through until almost 8, just before I reached Honfleur, and what a beautiful sight it was. I was riding on small country roads, and out of a corner the sun beams suddenly pierced the fog almost horizontally and shone through the trees to light up the road ahead. Breathtaking. 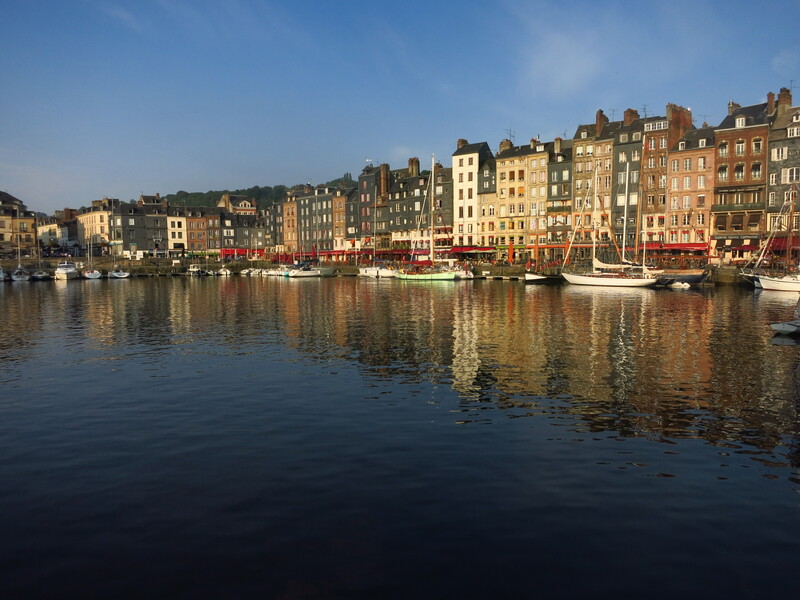 They say that if you want to take good pictures the best times are at sunset and at sunrise, and visiting Honfleur early in the morning I can say this is totally true. 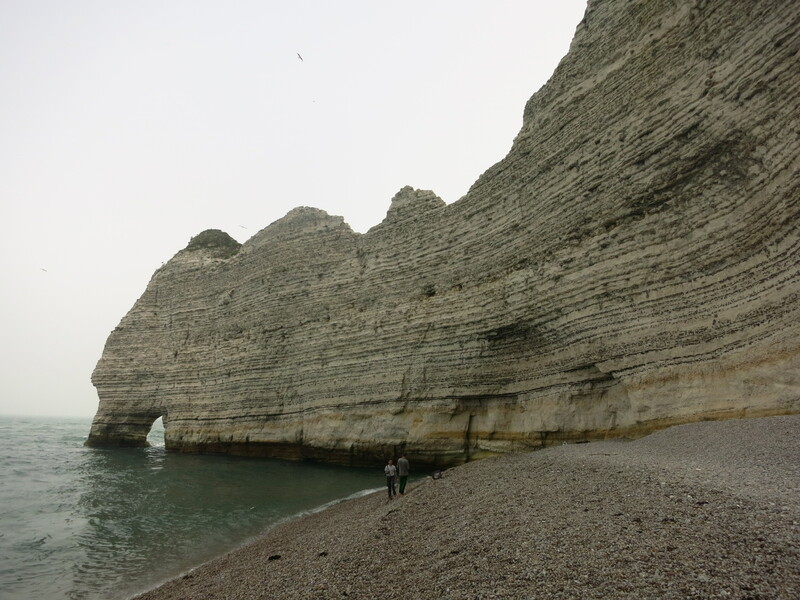 From there I headed to the famous cliffs in Étretat. 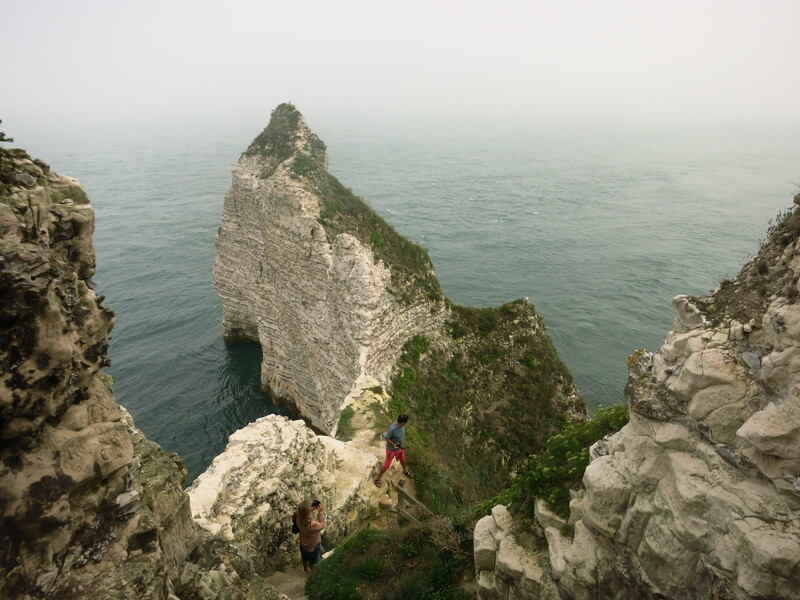 This is the landscape highlight of the Normandy coast, and as such attracts large amounts of tourists, but two things played in my favour – one, it was still early when I got there and two, I was on a motorbike, not a car. The village of Étretat is quite small, so there are lots of car parks in the surroundings to prevent tourists from clogging the narrow streets with their cars and motorhomes, but the French being generally very nice towards motorbikes, there were special spots for us right next to the beach. Cool. There was fog rolling in from the sea when I walked onto the promenade and I was just in time to see the impressive cliff arches at the end of the beach and snap a quick picture before they disappeared. To the other end of the beach there was a smaller arch which was not covered in fog, and the pebble beach was wide enough to walk near it at high tide. I took a long walk to stretch my legs a bit, today was going to be a long day on the bike, and I thought that a hike along the beach and back would be good exercise. I could not get to the arch itself because of the tide, but when I was about to turn back I saw a short metal ladder leading to a tunnel that had been cut on the cliff wall. 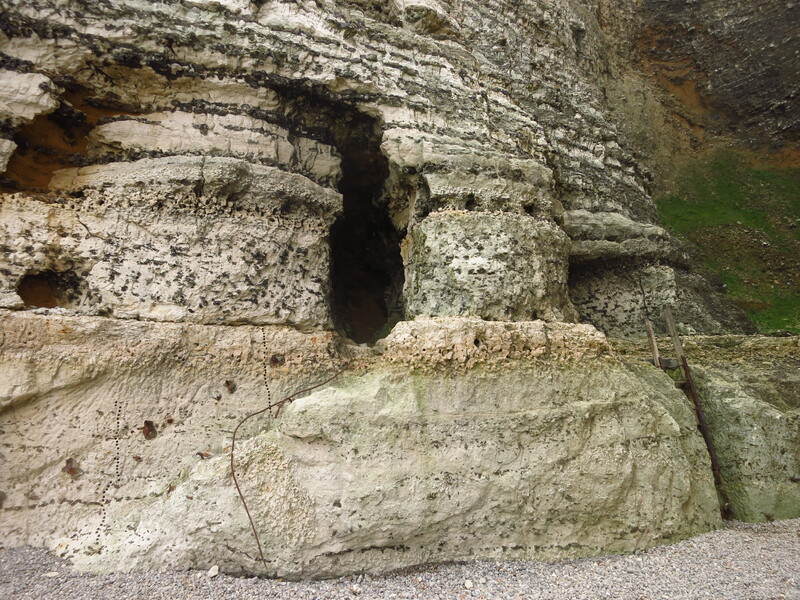 I had seen another tunnel on the way here and peeked into it, it seemed to gently slope down into the cliff. Not having my flashlight with me, and not wanting to risk getting into a tunnel that might flood with the flowing tide, I did not explore it any further. However, a family was coming out of this one, so I thought I would take a look. I climbed the ladder and saw light at the other end of the tunnel, not far. It was a relatively big tunnel, I could almost stand (I am 6 feet tall) and it led to the other side of the arch, where I found stairs climbing up the cliff face. Nice, I did not need to walk back to the town along the beach, time to do some exploring. They led up to the top of the promontory called Le Chaudron, from where a path that is part of the GR-21 led back down to the town. The fog was closing in here as well, and with no protections other than a few handrails on the stairs to get a hold while climbing or descending and the number of tourists that visit the place, I was surprised that it did not appear in the news more often because a tourist had fallen off the cliff. 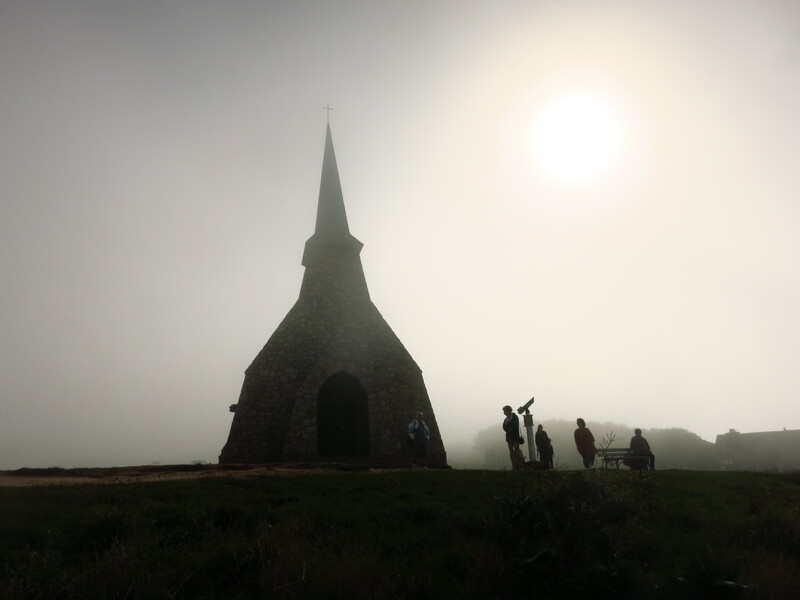 Before coming down I visited a small church overlooking the town and a monument called ‘L’Oiseau Blanc’, a memorial to WWI pilots Charles Nungesser and François Coli, who disappeared while attempting to cross the Atlantic on a white Levasseur PL.8 biplane. Two weeks later Charles Lindberg managed the feat on his Spirit of St. Louis. When I came back to the motorbike the tourist hordes had already begun to invade the town, and most of them seemed to have not understood what the car parks at the entrance were for. There was an enormous traffic jam in the narrow streets leading to and from the beach, clogged with cars full of tourists sheepishly looking for place to park their car right next to the beach that just did not exist. I got the hell out of there and hit the road for a long stint to the next stop – the Thiepval Memorial. This is the largest British war memorial in the world. It consists of two intersecting arcs du triomphe which are 43 metres tall, built on high ground that was controlled by the German army and that took a lot of lives to conquer. It is a memorial to all the British and South African soldiers who died in the Battle of the Somme and have no known grave, a total of 72.195 missing men. Visible from a long distance in all directions, I thought it looked a bit strange as I approached it. When I arrived I found out why… it was being restored. A big scaffolding covered the memorial, and the grounds around it were closed to the public. The positive side was that to compensate for that, the museum at the interpretation centre did not charge visitors, so at least I got an interesting lesson on WWI and the Battle of the Somme for free. 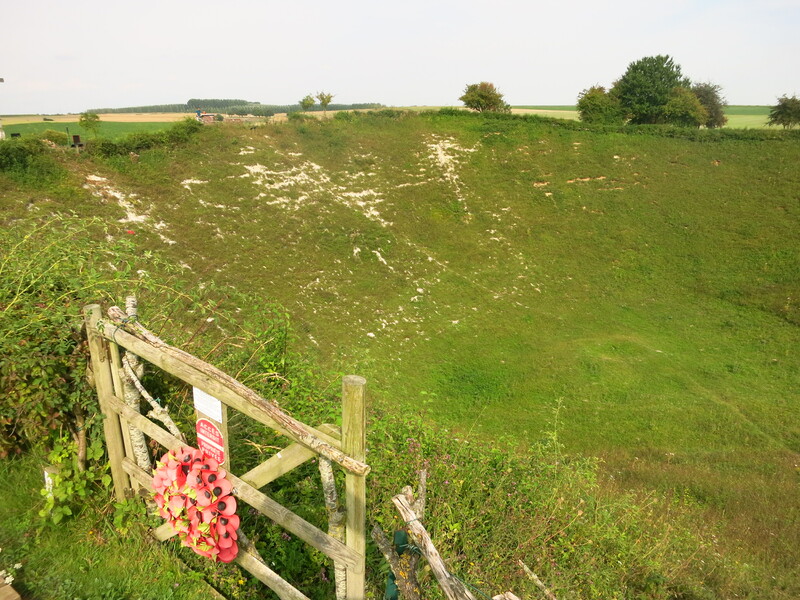 From there I rode along the lanes that gently roll up and down the countryside to the nearby site of the Lochnagar Crater, a 67-metre diameter whole created by the detonation of an underground mine by the British. They had been digging tunnels from their trenches to place mines under the German lines in preparation for an attack, and placed 27,000 kg of ammonal in the Lochnagar mine. At 7:28 of the 1st of July 1916, the first day of the Battle of the Somme, they detonated the charges, eliminating between 90 and 120 metres of German trenches. It was already mid-afternoon, but there was one more place I wanted to visit before heading for Brussels – the Somme American Cemetery. Unfortunately, it closed at 5pm, just 15 minutes before I got there. 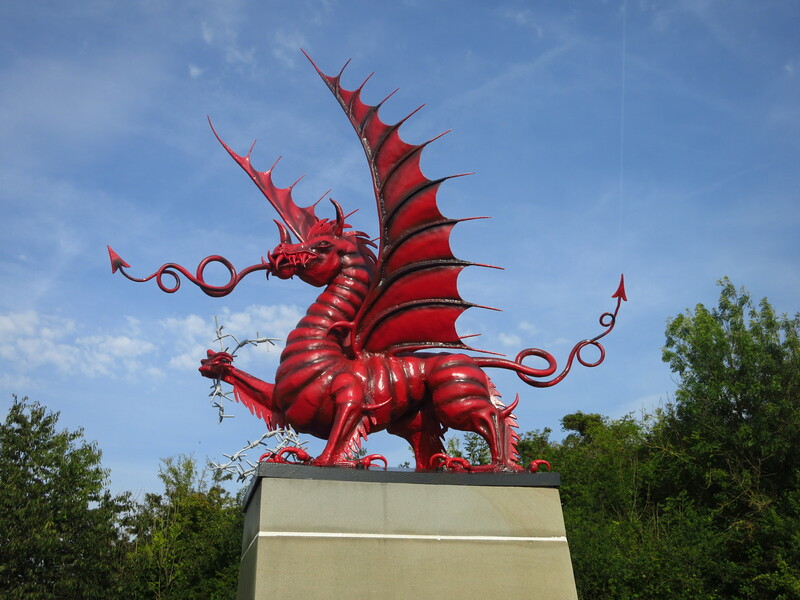 Well, never mind, the countryside was dotted with smaller Commonwealth cemeteries, and I had visited some of them, including a memorial with a Welsh dragon in the woods near the village of Memetz. I did my Erasmus in Swansea, where one of the battalions who fought here came from. They were the 14th Service Battalion, which lost 400 of their 676 men trying to take these woods. I got on the road for the ride to Brussels and it was not long before I reached the border, all traces of which have now disappeared, only a small sign by the side of the motorway indicating that I was in a different country. In fact, it was not the sign, but the driving of the other motorway users that warned me that I had changed countries. In this respect, the Belgians are very much like the Spanish. That is, they seem to have great difficulty in understanding the use of fast and slow lanes on the motorway. Unlike them, the French master this dark art – they always drive on the right until they encounter a slower vehicle, at which point they indicate, change to the fast lane, overtake, and go back to the slow lane. If there is another slow vehicle ahead, they wait until they are at a reasonable distance from it, and then repeat the manoeuvre. The Belgians behave just like the Spaniards – they come up to a slower-moving vehicle, change lanes, and then happily stay on the fast lane because there is a lorry or something other on the slow lane a few kilometres down the road. They do not care that there is faster moving traffic behind. It does not matter that the right lane is unoccupied. They are happy sitting smack in the middle of the fast lane, blocking everyone behind them. They are, like the Spaniards, very skilled at creating traffic jams. 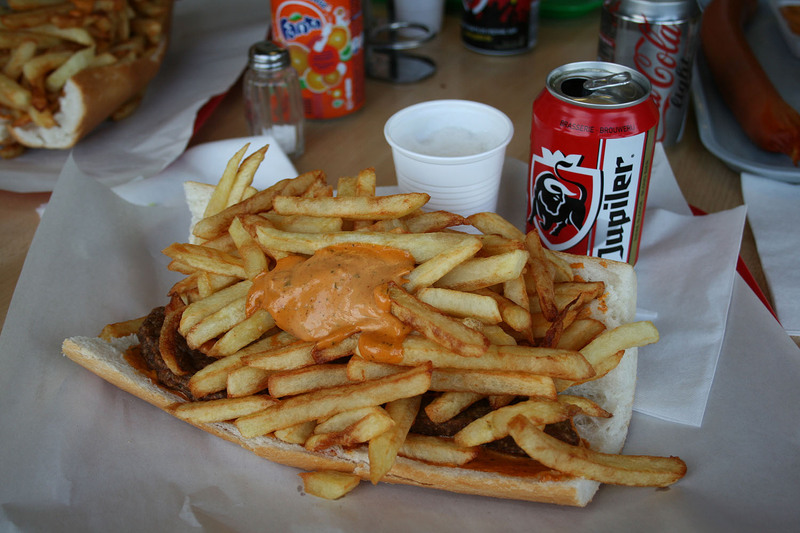 In spite of this, I managed to get Brussels, make my way through one of the most congested cities in Europe and find my friend’s apartment in time for dinner, which of course consisted of a good old mitraillette. 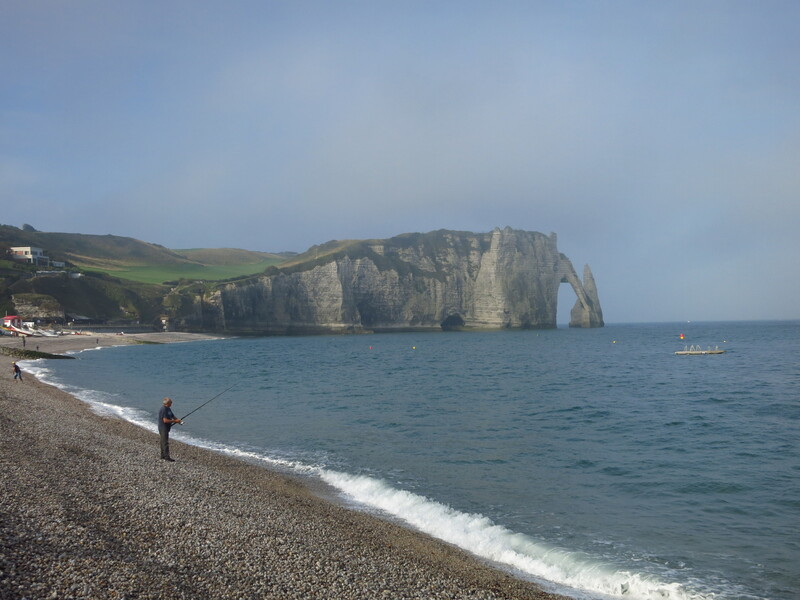 This entry was posted in Normandy 2015, Travel and tagged Étretat, Brussels, Honfleur, Lochnagar Crater, Memetz, mitraillette, Normandy, Somme battle, Thiepval, WWI by Kilian. Bookmark the permalink.